You finally find a stock to trade. You enter all the details with your broker. Your heart beats with excitement as you click, submitting your order. Your eyes are glued to the computer screen… waiting for profits. The hopes and dreams of a winning trade flood your head. Minutes, hours or even days later, your broker flashes red. Wait…the trade isn’t supposed to go against you!?! I’m sure you can write the ending to this tragedy. It’s a story we’re all too familiar with. Today, instead of rewriting the ending to that story, I want to help you rewrite the beginning. 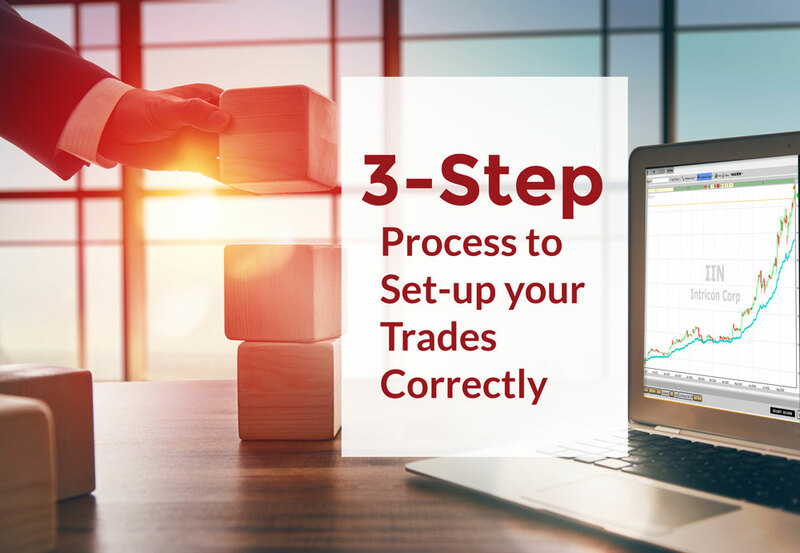 The set-up of any trade is the most important part and in today’s blog post, we’ll look at the 3-Step Process to Set-Up Your Trades Correctly. Some of the most dangerous words you can say as a trader are, “I’ll give it one more day.” When you say that, you typically watch small losses turn into big losses. To avoid this, you need to have a point where enough is enough. If the stock’s price crosses it, alarms start going off. It’s like when police set up that tape that says, “DO NOT CROSS,” everyone knows not to cross that line. If someone crosses the line, the police take action. 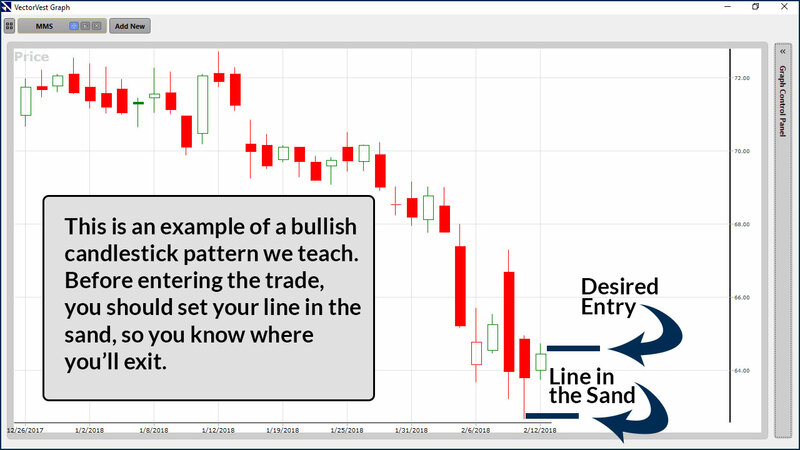 When you’re planning to enter a trade, before you enter it, you will set your line in the sand. This will be the price where you know you’ll get out. If it’s a short-term trade, that line will be closer such as a recent swing low or the low of a recent candle. 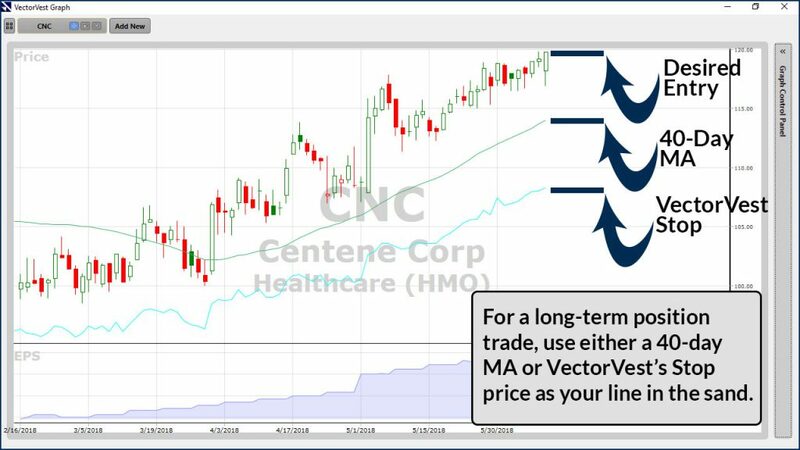 If it’s a long-term trade, you’ll want to give the stock more room to breathe and use something farther away, such as a 40-day moving average. Or if you use VectorVest, you can use its STOP price. Either way, before you enter the trade, take out a pen, marker or something permanent and write down that price. That is your line in the sand and if price crosses it, you exit. Key Takeaway: Draw your line in the sand before you buy a stock, and stick with it. Too many people are taught to buy stocks on the way down. You know what that leads to? Owning stocks that are going down. The way to avoid that, is to buy stocks that are already doing what you want…going up! 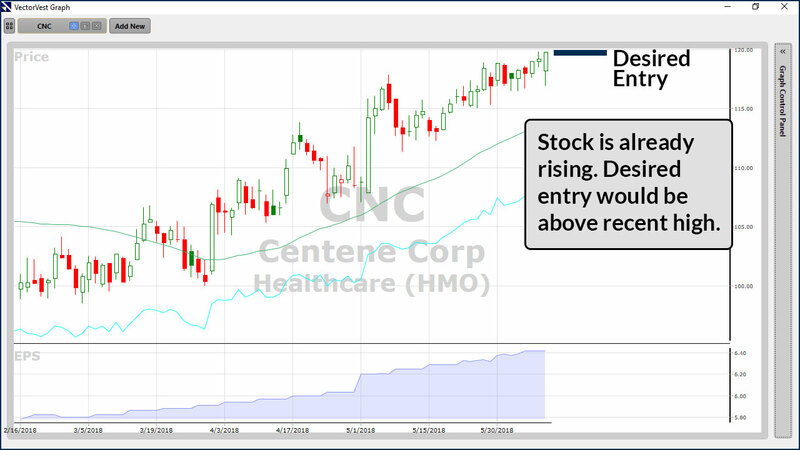 Whether you’re a short-term trader or you’re looking for positions to hold for weeks to months, you still want to make sure you buy your stock on the way up. 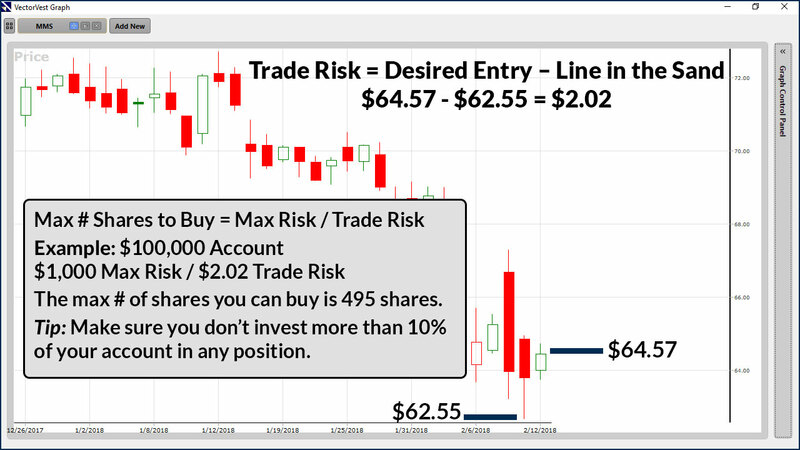 The exact entry point will vary depending on your investing style. Key Takeaway: Prior to buying a stock, determine an entry point that ensures the stock is moving higher at the time you buy it. Most investors have a predetermined dollar amount they spend on each stock they buy. This is a mistake, which could have one big consequence. 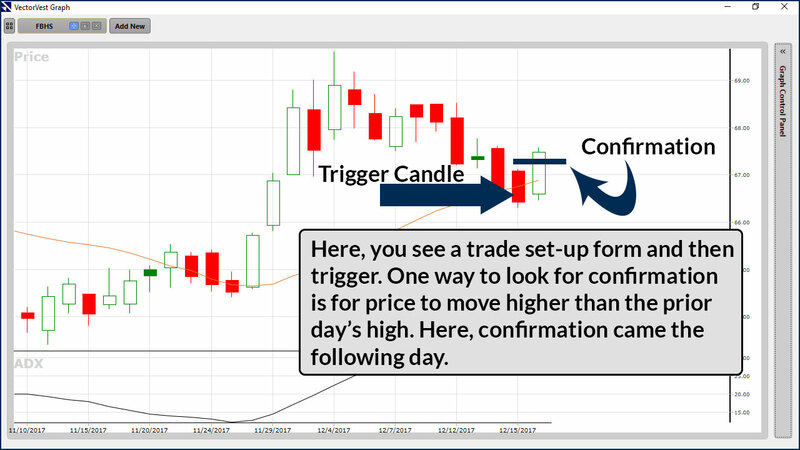 Even if you’ve set the right stop price, you could be risking too much money on the trade. You should only risk 1% of your trading account on any trade. 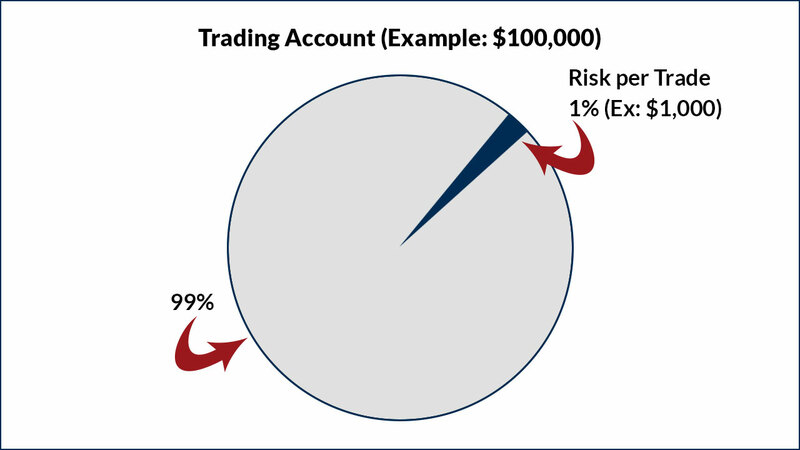 For example: If your trading account is $100,000, you should only risk losing $1,000 on any stock trade. Click or tap images to enlarge. Doing this has two tremendous benefits: First, your losses are kept small, which allows you to live to fight another day. Second, you can remove emotion from your trading and are much more likely to follow your plan. Even if a stock goes against you, you know the most you will lose is 1% of your total trading account. Key Takeaway: Buy the right number of shares to ensure you follow the 1% rule. Setting up your trades prior to entering them, helps you win the battle. It allows you to trade without emotion and it puts you in control. That’s how professionals do it and you can do it too!